Our sense of place in the world is mediated through our everyday interactions with both people and space (Seamon, 1985). Everydayness is one of the most profound levels and shapers of human experience, yet too often this level of relation is overlooked and taken for granted in the design of environments (Dyck, 2005; Tuan, 1977). In this article, I present a first-person phenomenological account of my everyday interactions with doors on a university campus to uncover contested notions of interiority. My body-space routines reveal how a sense of outsideness/insideness is controlled through my interactions with objects such as doors, door handles and thresholds. 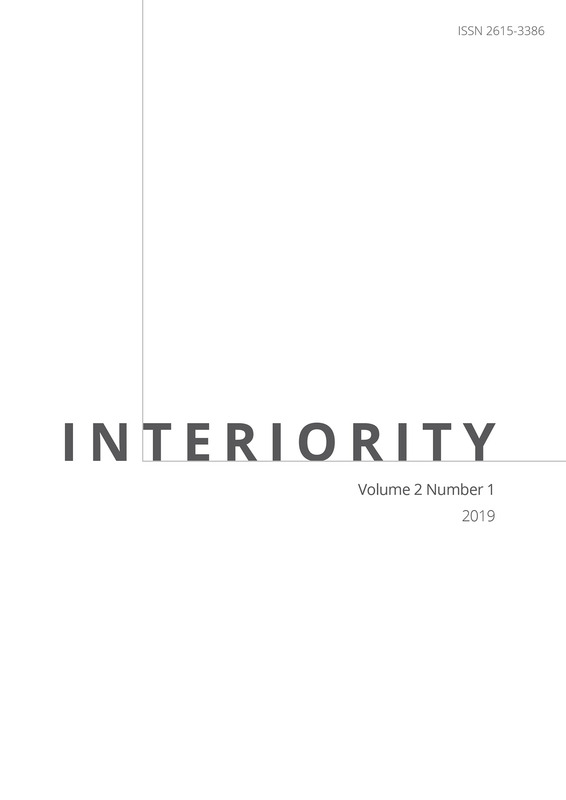 These accounts suggest that given our everyday activities are intrinsically linked to designed environments (Upton, 2002) and that interiority is relational (Atmodiwirjo & Yatmo, 2018), adopting an everydayness frame from diverse users’ perspectives is imperative to improve human experiences and spatial justice within design practice. This is critically important for non-normative bodies like mine whose subjective experience of interiority is constantly being disputed and denied by hostile materiality. Lisa Stafford (PhD) is a social scientist, human geographer and social planner who seeks to achieve spatial justice through the creation of inclusive everyday environments. She has over 17 years of experience in the field of disability and inclusion, with interests in inclusive planning and design and the social-spatial needs of children, young people and their families. Her research specialities include: geographical phenomenology, person-environment studies and participatory research methods. Anderson, J. (2011). Architectural design. Lausanne: AVA Academia. Atmodiwirjo, P. & Yatmo, Y. A. (2018). Interiority as relational. Interiority, 1 (2), 87-90. Buttimer, A. (1980). Introduction. In A. Buttimer & D. Seamon (eds. ), The Human experience of space and place (pp. 13-18). New York: St Martin’s Press. Chouinard, V. (1997). Making space for disabling differences: Challenging ablest geographies. Environment and Planning D: Society & Space, 15, 379–387. Dovey, K. (2008). Framing Places: Mediating power in built form. (2nd ed. ), (pp. 46-60). Oxon: Routledge. Dreyfuss, H. (1984). Symbol sourcebook: An authoritative guide to international graphic symbols. London: Wiley & Sons. Dyck, I. (2005). Feminist geography, the ‘everyday’, and local–global relations: hidden spaces of place-making. The Canadian Geographer / Le Géographe canadien, 49(3), 233–243. Finlay, L. (2011). Phenomenology for therapists. Research the lived world. Oxford: John Wiley & Sons. Garland-Thomson, R. (2017). Extraordinary bodies: Figuring physical disability in American culture and literature (Twentieth anniversary edition.). New York: Columbia University Press. Goffman, E. (1963). Stigma: Notes on the management of spoiled identity. New York: Simon & Schuster Inc.
Grosz, E. & Eisenman, P. (2001). Architecture from the outside: Essays on virtual and real space. Cambridge: MIT Press. Imrie, R. (2003). Architects’ conception of the human body. Environment and Planning D: Society and Space, 21, 47–65. Imrie, R., & Kumar, M. (1998). Focusing on disability and access in the built environment. Disability & Society, 13(3), 357–374. Lang, R. (1985). The dwelling door: Towards a phenomenology of transition. In D. Seamon & R. Mugerauer (Eds. ), Dwelling, place & environment (pp. 201-214). New York: Columbia University Press. Le Corbusier (1956). The modulor: A harmonious measure to the human scale universally applicable to architecture and mechanics (P. de Francia & A. Bostock, Trans.). London: Faber & Faber. McCarthy, C. (2005). Toward a definition of interiority. Space and Culture, 8 (2), 112-125. McLean, Loyola, Stafford, Lisa, & Weeks, Mark (Eds.) (2014) Exploring bodies in time and space. Oxford: Inter-Disciplinary Press. Meade, T. (2013). Interior design, a political discipline. In G. Brooker & S. Stone (Eds. ), The handbook of interior architecture and design (pp. 394-403). London: Bloomsbury. Merleau-Ponty, M. (2012). Phenomenology of perception. (D. A. Landes, Trans.) Oxon: Routledge. (Original work published 1945). Middleton, J. (2011). “I’m on autopilot, I just follow the route”: Exploring the habits, routines, and decision-making practices of everyday urban mobilities. Environment and Planning A, 43(12), 2857–2877. Neufert, E. (1936/2012). Architects’ data (4th ed). West Sussex: Wiley-Blackwell. Relph, E. C. (1976). Place and placelessness. London: Pion. Relph, E. C. (1985). Geographical experiences and being-in-the-world: The phenomenological origins of geography. In D. Seamon & R. Mugerauer (Eds. ), Dwelling, place, environment: Towards a phenomenology of person and world (pp. 15–32). New York: Columbia University. Scully, J. (2008). Disability and the thinking body. In K. Kristiansen, S. Vehmas & T. Shakespeare (Eds. ), Arguing about disability: Philosophical perspectives (pp. 57–73). Hobooken: Routledge. Seamon, D. (1980). Body-subject, time-space routines, and place-ballets. In A. Buttimer & D. Seamon (Eds. ), The human experience of space and place (pp. 148–165). London: Crom Helm. Seamon, D. (2002). Physical comminglings: Body, habit, and space transformed into place. Occupation, Participation and Health, 22(10), 42S–51S. Seamon, D., & Mugerauer, R. (Eds.). (1985). Dwelling, place, environment: Towards a phenomenology of person and world. New York: Columbia University. Seamon, D., & Sowers, J. (2008). Place and placelessness: Edward Relph. In P. Hubbard, R. Kitchen, & G. Valentine (Eds. ), Key texts in human geography (pp. 43-51). London: Sage. Stafford, L. (2013). The journey of becoming involved: The experience of participation in urban spaces by children with diverse mobility. PhD thesis, Queensland University of Technology. Tuan, Y. (1977). Space and place: The perspective of experience. Minneapolis, MN. : University of Minnesota. Upton, D. (2002). Architecture in everyday life. New Literary History, 33(4), 707-723. Weiss, G. (2015). The normal, the natural and the normative: A Merleau-Pontian legacy to feminist theory, critical race theory and disability studies. Continental Philosophy Review, 48(1), 77–93. Weissman, L. K. (1992). Discrimination by design: A feminist critique of the man-made environment. Urbana: University of Illinois. Wolbring, G. (2008). The politics of ableism. Development, 51(2), 252–258.